These days, several companies are being plagued by low level of employee engagement. With rapidly changing global markets, technological advances, and companies doing cost reductions, job security has become a major concern for the employees. The stress levels have increased, affecting their loyalty towards the company. As a result, HR professionals are being challenged with negative attitudes, low productivity, reduced employee retention rates and increased absenteeism from the workplace. 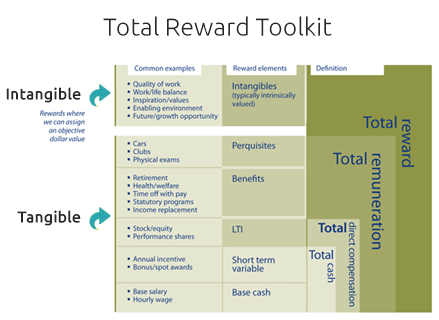 To deal with these challenges, every organisation requires a strategic employee reward system that can address compensation, recognition, benefits and appreciation. 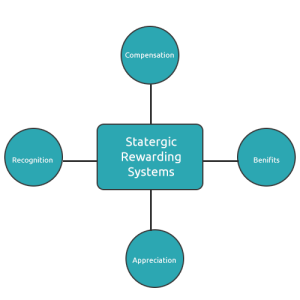 In most of the rewards systems existing in business world these days, one or more of these elements are missing, and even when these elements are addressed, they are not aligned with other corporate strategies and core values. Employees need to know, and must be informed if they are doing bad, good, or excellent. Recognising their value, offering benefits, and providing a good life/work balance are quite effective employee motivator. 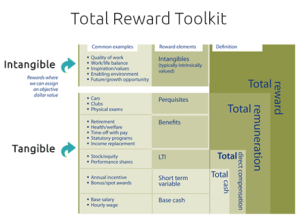 Researches indicate that less than half of the organisations have reward programs. Research also indicates that the employers that do have formal employee reward system see tangible benefits such as improved employee engagement and productivity, and improved financial performance for their organisation. Business owners often think of compensation as the top reward, however the reward system needs to be based on compensating someone for the contributions being made that are important for the organisation. These could be thinking out of box, outstanding innovator, outstanding philanthropist, the risk taker, multitasker, most Resilient, or for enhancing customer relations. A recent survey by McKinsey indicated that the three most effective motivators than highest-rated financial incentives included praise from immediate managers, leadership attention and chance to lead task forces or projects. Employee reward system should be based on the values, vision and goals of the organisation, and modifications must be done to make the entire process special and rejuvenating for the employees. A well-balanced reward system must recognize the performance and behaviour of the employees. As performance is directly linked with the final outcomes, it is easier to address. Appreciation and Recognition are the most underrated rewards, and are ignored by most businesses. These are high-return and low-cash ingredients, and must be an integral part of a well-balanced reward system. The simple act of expressing gratitude and acknowledge the performance can have positive impact on the employees, increasing their morale, and improving their performance. 1. Google offers free food, outdoor sports facilities, indoor games etc. to its employees Additionally, irrespective of the tenure with the company, if the U.S employee passes away while working with the company, the partner or spouse get 50% of the salary every year for the next ten year. 2. Developer of people-management software, Ultimate Software gives free vacation to the workers every two years. 3. NetApp Vice-Chairman Tom Mendoz calls 10-20 employees every day to give them special recognition, and thanks them personally for doing something extraordinary. 4. Chesapeake Energy paid bonus of more than $8 million to around 6000 employees for following safe work practices. 8. To help employees deal with the work related anxieties, employees at Mayo clinic get massages in their stress-free zone. 9. Intel offers eight-week paid sabbatical and $50,000 for tuition reimbursement to its employees, Aflac hosts annual appreciation week, GoDaddy takes employees off-site during paid work hours for different fun activities, Producers Assistance Corporation offers reloadable gift cards, and Zappo has “Monthly Hero” program. Organisations are also using more innovative methods such as recognition and reward using the social media, early recognition to improve employee retention, creating a culture of rewards and recognition with a clear tie to the core values of the company, investment in staff engagement campaigns spanning the entire business, rewarding longest-serving employees to make them feel valued and encouraging other staff members to be loyal, extending the reward to employee’s spouses and families etc. Looking at these incentive programs, it can be deduced that employees want to look beyond the pay check, and expect rewards with diverse blend of incentives, business practices and benefits that help them stay loyal and motivated. A well-balanced reward system can benefit both employees and the organisations, creating a competitive advantage for the companies. I am the CEO. I am the Employee. No Management. No Subordinates. Is Workspace 2.0 ready to take self-management to its logical conclusion? How flatter can an organization get in the context of workplace 2.0 which hates hierarchy? From the Buck Stops Here to the Buck Starts Here? The knowledge worker of today doesn’t bat an eyelid cracking Dilbert jokes with his boss at the water cooler. All this is the new normal (?) and that’s why management tomes like ‘First, fire all the managers’ fly off the shelves faster than you can actually do that. All this is oh-so romantic and utopian. But would Apple run by a million CEO workers have been better than Apple under Steve Jobs? Jobs, according to people who worked closely with him was more of an autocrat than less. Damn! Not fashionable at all. Jack Welch too by all accounts can hardly ever be a pinup idol for zero hierarchy. Of course they were all for empowering the down lines, but finally, the nuclear button vests with them. From a historical perspective, there’s nothing “new” about self-management. Peter Drucker way back in 1953 in his classic ‘The Practice of Management’ called for empowering workers as managers and more importantly, said, it requires new tools and far-reaching changes in traditional thinking and practices. Now that we have the new tools and think out of the traditional box, more and more companies are putting the Drucker test to practice. Gary Hamel, “the world’s most influential business thinker” according to the Wall Street Journal and author of the recently released What Matters Now, showed how Morning Star, a leading food processor, had made it to the top without bosses, titles or promotions in his analysis published in Harvard Business Review. The California-based Morning Star, the world’s largest tomato processor handling nearly 30% of the tomatoes processed each year in the United States and with annual revenues of $700 million is not just a Drucker dream-come-true but a company which has registered phenomenal success. And that’s why it makes you pause and ponder. Is it really possible for an organization to become a global market leader where there’s no CEO, where everyone can spend the company’s money, and where each employee is responsible for acquiring the tools needed to do his or her work? As Hamel explains in his case-study, Morning Star is built on the edifice of five fundamentals, viz. Make the mission the boss; Let employees forge agreements; Empower everyone – truly; Don’t force people into boxes; and Encourage competition for impact, not for promotions. So why aren’t we seeing more Morning Stars shine bright? If self-management has evolved from a nice-sounding slogan to a workable sound business strategy that can enable organizations to grow to the pinnacle why is it still unfamiliar to most of us? The view from the cubicle (and even from the CEO’s penthouse) is that self-management is an idea whose time has come as much as it is an idea which is yet to really take off. Contradictory? Yes, but check your premises – and we mean your company premises. People are not ready yet. Paul Green Jr., who helps run the Self-Management Institute launched by Morning Star, is on record having admitted that not even one company to his knowledge has “fired all the managers all the way” a la Morning Star and hit pay dirt.